Ekphrasis (pronounced ek-fra-siz) is a literary description of, or commentary on, a work of art. The instructional zine below is available free of charge to art galleries, community spaces, museums, libraries, and other organizations who wish to introduce this activity to their patrons and visitors, allowing them deeper interaction with art of any style or school. This activity is made possible by an Artist Grant from the Prairie Lakes Regional Arts Council with funds provided by the McKnight Foundation. Click here to download the zine PDF. Print one-sided on a 8.5x11 sheet of white or colored copy paper. Make sure your printer is set to print at 100% scale (do not fit to page). There should be an equal empty border around all of the edges. Fold in half along the length, then unfold. Fold in half along the width, then unfold. Fold both edges to the middle, then unfold. Cut a slit along the length, in the center of the page (2 panels wide). Fold the paper length-wise and press out the center cut so it looks like a plus sign. Bring this zine with you to your favorite gallery or museum (and maybe leave a few copies behind for other patrons to enjoy). 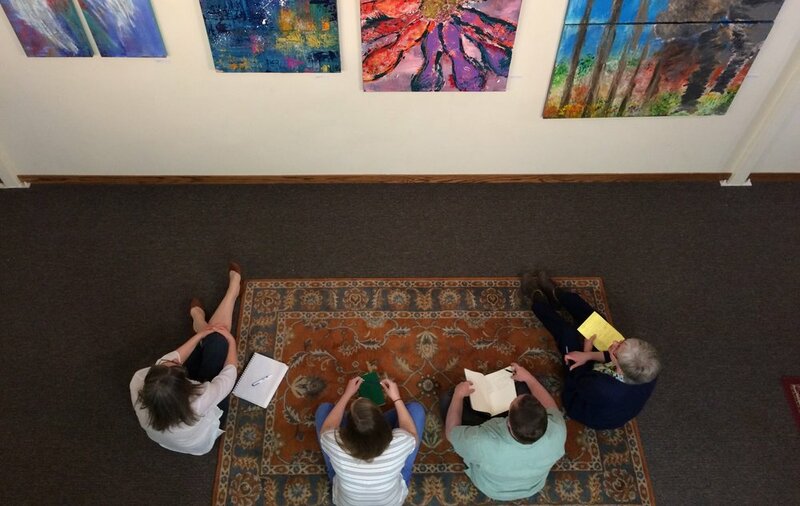 Erin Dorney has led guided ekphrastic writing tours since 2016. If you are interested in setting up a workshop, artist talk, or trading zines, please get in touch!